The severe weather system that has already killed at least 43 people across 7 states since Wednesday is continuing its stronghold across the nation. What started with deadly tornadoes in Texas and flash flooding in Illinois has continued south and across the Midwest on Sunday and Monday. Its put highways of truck drivers and holiday travelers to a standstill and has grounded thousands of flights. While the East Coast got to celebrate Christmas with unusually warm temperatures, several tornadoes tore through Texas on Saturday evening, killing at least 11 people and caused widespread damage to homes, schools and hospitals. 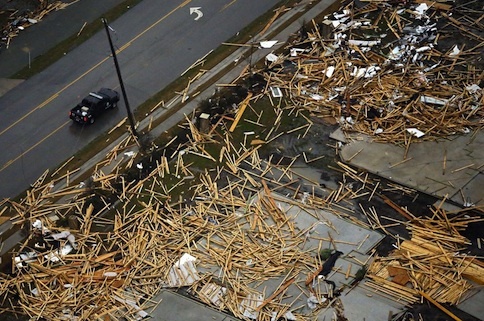 The National Weather Service has since confirmed a tornado that struck Garland, Texas was an EF4, which the second-most-powerful tornado on the damage scale and are generally strong enough to level well-constructed homes and toss cars. On Monday, the National Weather Service said those storms were continuing to pound portions of the Southeast, including much of Mississippi, Alabama and the Florida Panhandle. 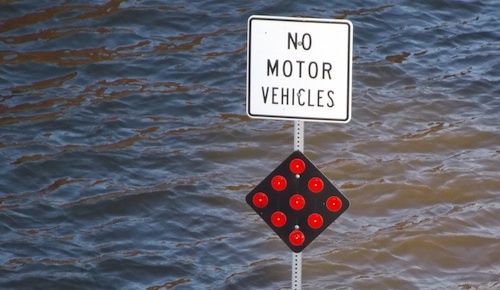 Missouri and Arkansas have also been battling drenching rains and flooding. By Sunday, New Mexico had declared a state of emergency ordering the National Guard to assist the many travelers stranded by ice and snow, especially eastbound of Interstate 40. Troops spent much of the day rescuing motorists who were trapped on the roads and the New Mexico State police have continued to warn motorists that the roads east of Albuquerque to the Texas state line are too dangerous for driving, including Interstate 40. 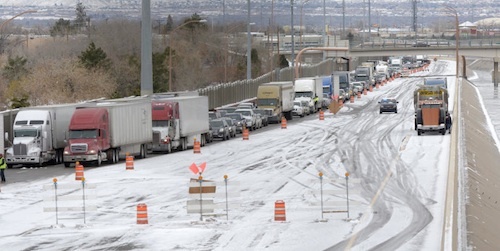 Several truck drivers even took caution staying off the roads and spent the weekend stranded in Albuquerque instead. “A day and a half pretty much affects about 1,000 miles, and that affects my paycheck,” said Manny Iribe. But although he estimates the weather will cause him to lose about $800 for this single trip, he’d rather be safe than sorry. “Some people might try to go through it. I would advise not. Money always comes, safety always has to be there,” he said. On Monday, the storm continued its grips in parts of Texas and across Oklahoma and New Mexico with a dangerous mix of snow, ice and flooding. The National Weather Service also issued a weather warning for heavy snow and dangerous ice storms across the Upper Midwest, with Iowa, Minnesota, Wisconsin and Michigan expected to be hit with the worst. Even the Northeast is expected to be hit, with up to 8 inches of snow were for Portland, Maine by Tuesday. On Sunday over 1,600 flights were canceled and 6,300 delayed across the country, and as of Monday morning, nearly 1,000 domestic flights had been canceled and more than 1,000 were expected to be delayed.